Found one file extension association related to SymPhoTime 64 and 1 file format developed specifically for use with SymPhoTime 64. 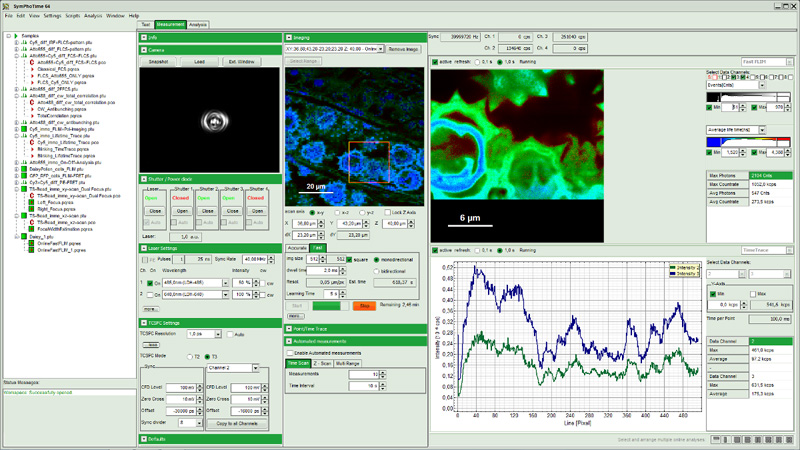 The SymPhoTime 64 software package is an integrated solution for data acquisition and analysis using PicoQuant's time-resolved confocal microscope MicroTime 200, LSM upgrade kits or TCSPC electronics. Its clearly structured layout and powerful analysis routines allows the user to focus on the results rather than on the data processing. The software is designed for a 64 bit operation system and features a graphical user interface (GUI), which guides the user through all necessary steps for an individual analysis or measurement process. Data dependencies are directly visible in the underlying workspace concept. An integrated scripting language ("STUPSLANG") even puts the user in a position to freely add new analysis procedures or customize existing ones. If you need more information please contact the developers of SymPhoTime 64 (PicoQuant), or check out their product website.